More English language signs and dedicated English-speaking tourism staff, along with announcements in the language in the Moscow Metro will make life much easier for a foreign tourist in the Russian capital. A few days ago, while walking on the streets of Central Moscow, an Indian friend of mine noticed some reprints of paintings that donned the outer walls of buildings. This was yet another initiative by the tourism authorities in the Russian capital to beautify the city and promote culture. The only problem was that the explanations were only in Russian and I had to translate. My friend, who is in her late-50s and has no gift for learning foreign languages, told me that I walk around freely in the city only because I don’t have a language barrier. Fair enough. I work for a Russian organization and am very often in the country, so I really should know the language. But what about those who are in the country for just a few days? Many of us like to travel but we simply cannot learn every language in the world. To see, how an independent non-Russian speaking traveler can get around Moscow, I tried a small experiment. Armed with a hidden camera, I played dumb and acted like someone who doesn’t read or speak Russian and tried to navigate the metro and see some attractions in the city. The daylong experiment was an eye-opener for me. The metro is easy to use if you can understand Russian. The signs are well marked, the announcements clear and the staff helpful. But for those armed with just English, using the metro alone can be a daunting task. For starters, the announcements are only in Russian and unless someone is clear about how the station sounds, he or she is likely to miss it. All the wagons have a map with the names of the stations in English, albeit in a tiny font. Given, how crowded the metro is, it is often difficult to spot the map. When I got off the Oktyabrskaya metro station, I approached a member of the metro staff to ask about how I could get to Gorky Park. I spoke slowly in completely unaccented English. The woman, who was in her 40s, could not understand me. Then, I showed her a picture of the park from a guidebook, and then started explaining in Russian. When I had a confused look, she started explaining slower and louder. For someone not aware of the nuances of Russian culture, her tone of voice may have been intimidating. Finally, a student took pity on the ‘dumb foreigner’ and escorted me out of the station and showed me the way. In fact, during the experiment, I managed to get around solely thanks to young Muscovites who had a decent level of English proficiency. Let’s face it: independent foreign tourists should not have to depend on the kindness of strangers to be able to get around. There are signs of change in the city center. Many street signs are written in English as well, and there are tourist maps that explain the way. But on the whole, for a non-Russian speaker, it’s easy to get lost. When I spoke to some Moscow city officials about the problem, I was told that Russians who don’t speak English have similar issues abroad. Such is the arrogance! I most certainly do not like the stereotypical monolingual native English speaker’s attitude towards foreign languages, but we have to face a reality that English is the de facto lingua franca of the world. Even Beijing’s metro has proper signs and announcements in English. Moscow is undergoing a facelift and is easily one of the most beautiful capital cities in the world. Each time I am here, I notice some positive changes or the other. Gorky Park is absolutely world class. 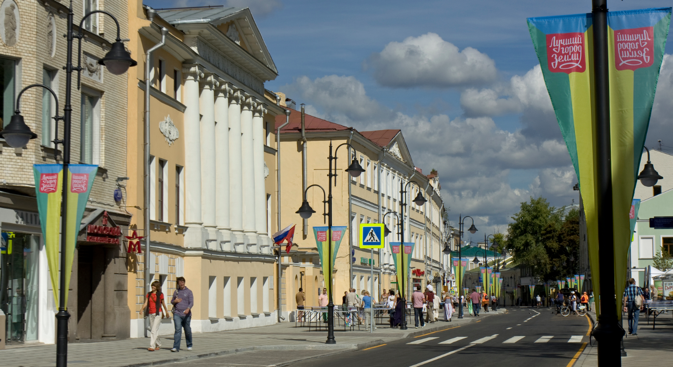 The newly and tastefully restored Pyatnitskaya Street is something that should be the pride of the capital. The initiatives taken by the city authorities are visible far and wide, and not just in the historic center. Yet, for Moscow to get sustainable revenue from tourism, the city must absolutely become more international tourist friendly. There is a growing middle class in India that would relish the sights and sounds of Moscow. The city is as safe as it has ever been, and no longer considered as expensive, given the fall of the ruble. However, without a local guide or friend, it is just enormous and challenging. One of the simplest measures that the Moscow authorities can undertake is to include English-language announcements on the metro. This will be the biggest help for foreign tourists. They could also set up tourist information centers with English-speaking staff in the heart of Moscow. An easy way to start would be to hire university students as interns. The 2018 FIFA World Cup is drawing closer and it is a great opportunity to showcase Moscow and Russia to the world. The tournament can trigger a tourism boom to the country, but for that, Russia needs to become more English-friendly.